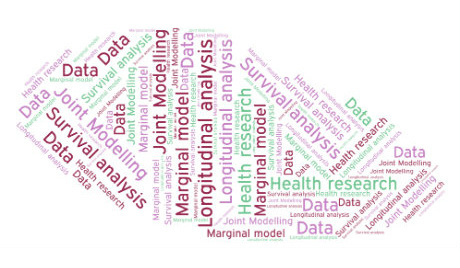 The purpose of the workshop is to provide an introduction to joint modelling of longitudinal and survival data and its practical relevance in health research. This three-day workshop has as main objective to give a broad introduction to various topics in the fields of longitudinal analysis, survival analysis and joint modelling. Throughout each of these topics various opportunities will be provided for participants to work with real data through modelling examples and associated computer implementation in the freely available and documented R software. Diggle, P. J., Sousa, I., & Chetwynd, A. G. (2008). Joint modelling of repeated measurements and time‐to‐event outcomes: The fourth Armitage lecture. Statistics in Medicine, 27(16), 2981-2998. Henderson, R., Diggle, P., & Dobson, A. (2000). Joint modelling of longitudinal measurements and event time data. Biostatistics, 1(4), 465-480. Hickey G, Philipson P, Jorgensen A, Kolamunnage-Dona R (2018). joineRML: A joint model and software package for time-to-event and multivariate longitudinal outcomes. BMC Medical Research Methodology. Hickey G, Philipson P, Jorgensen A, Kolamunnage-Dona R (2017). A comparison of different joint models for longitudinal and competing risks data: with application to an epilepsy drug randomised control trial. Journal of the Royal Statistical Society - Series A. DOI: 10.1111/rssa.12348. Philipson P, Diggle P, Sousa I, Kolamunnage-Dona R, Williamson P, Henderson R (2012) joineR: Joint modelling of repeated measurements and time-to-event data. Comprehensive R Archive Network, United Kingdom. Sousa, I. (2011). A review on joint modelling of longitudinal measurements and time-to-event. Revstat, 9(1), 57-81. Williamson, P. R., Kolamunnage‐Dona, R., Philipson, P., & Marson, A. G. (2008). Joint modelling of longitudinal and competing risks data. Statistics in medicine, 27(30), 6426-6438. Ruwanthi Kolamunnage-Dona is a Reader in Biostatistics at the University of Liverpool. She has established research expertise in joint modelling of longitudinal and event time data in various applications of medicine. She has led many training workshops on joint modelling. Inês Sousa, PhD in Statistics is Assistant Professor at Department of Mathematics and Applications, University of Minho. She has scientific interests in the development of statistical models for longitudinal data motivated by real data in biosciences. She is member of the Centre of Molecular and Environmental Biology, University of Minho (CBMA-UM). Laetitia Teixeira, PhD in Applied Math is Invited Assistant Professor at Institute of Biomedical Sciences Abel Salazar, University of Porto. She has start work in joint modelling of longitudinal and survival data in the presence of competing risks in her PhD, with application in Peritoneal Dialysis problem. Denisa Mendonça, PhD in Biostatistics is Associate Professor at the Institute of Biomedical Sciences Abel Salazar, University of Porto. She is member of the EPIUnit, Institute of Public Health, University of Porto (ISPUP). Audience: The workshop is targeted for researchers, Master and PhD students in the field of statistics, mathematics, medicine, health or other related areas. Requirements: Basic knowledge of statistical concepts. A basic knowledge of R is preferable, though not essential. Workshop material: In each session students will receive printed and PDF copies of the slides and practical sheets. Course materials will be available in English. Certificate: A certificate of participation will be given to the participants who attend at least 75% of the course. Venue: The workshop will take place in Computer Room (3rd floor) at the Institute of Public Health, University of Porto - Rua das Taipas, nº 135, Porto, Portugal. 250€ (-20% for ISPUP Collaborators and Students from Specialization Course in Public Health, Master in Public Health or in Oncology, PhD in Public Health, Global Public Health or Applied Mathematics, Members of SPE or APE). Limited to 20 participants.